Conceived as part of our successful submission to join the Mayor of London’s Architecture Design Urbanism Panel for Cultural Strategies. 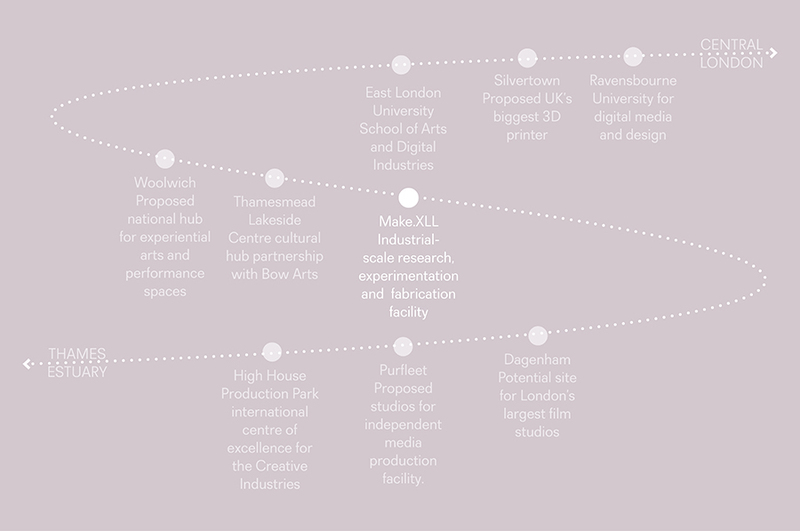 Our brief was to propose a new major innovative cultural or production facility in the Thames Gateway. Successful proposals demonstrated an understanding of the key issues facing the creative sector in London, strengthening the sector and supporting the community within which it is located. 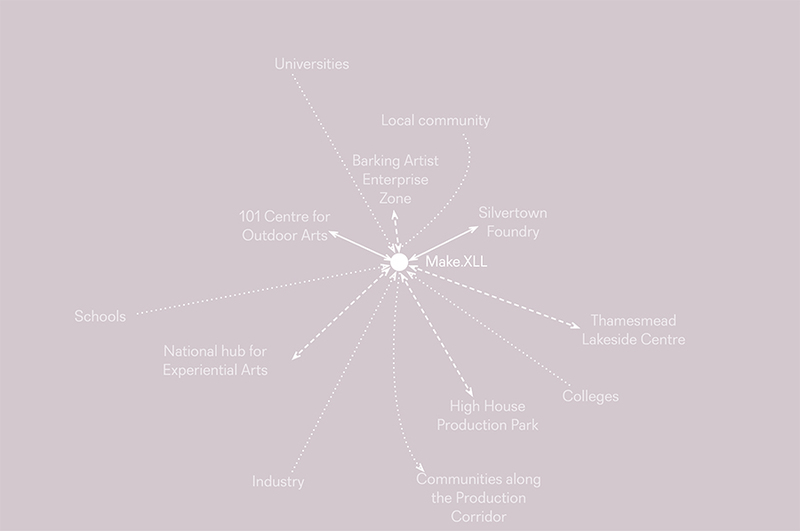 Responding to the Thames Estuary Production Corridor concept and London’s need for more space to fuel the creative economy, Make.XXL would be Europe’s largest ‘pay as you go’ creative production ecology. We will muster a range of large-scale flexible creative production, research and education facilities for multiple partners and users, whilst nurturing future talent. Large-scale indoor and outdoor spaces for short to medium-term use are proposed for a scale of diverse creative making and experimentation that struggles to find a home – production set builds, performance spectacle and rehearsal, prototyping, artworks, architectural testing or building experiments. Make.XXL allows for the production of outdoor arts that are beyond the scale of other creation spaces. The facilities Make.XXL provides will offer a blank canvas whilst the ceramic centre provides specialist facilities for large scale art and architectural making and kiln firing. A reconfigurable ‘rough’ space can be hired for affordable, artist-led and commercial uses, commercial users being particularly attracted by proximity to central London and ability to bring in their own technical teams and equipment. The site will have the technical support necessary to make ideas a reality through permanent on-site workshops, skilled staff, and a robust tool hire library. To compliment this a ‘dirty’ space is available for extra messy work such as large scale sand blasting or spray-painting, and a ‘clean’ space within the research and education hub. 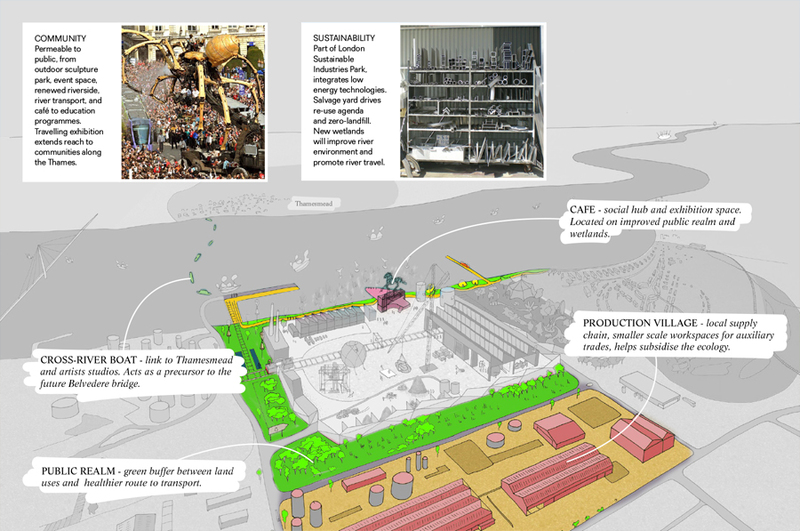 The ‘Re-use’ large-scale salvage yard will re-distribute and share unwanted materials, inviting reinvention and inspiring remaking activity, and providing a low-cost supply of materials to artists/makers. A creative research and education hub, with connections to industry and higher education, will foster collaboration, whilst inspiring the creative innovators of the future. The Creative & Materials Research Centre will enable focused experiment and exploration towards tangible social and creative innovation. It will offer residential opportunities for bespoke research projects and an away-space for the many excellent smaller arts and technology labs across the UK needing flexible space for partnership and experimentation. Make.XXL will support the local community in a variety of ways. It will generate new jobs, educational benefits and flexible work and storage space at the next-door Production Village. The Production Village will encourage a local supply chain by providing smaller scale workspace for supporting trades such as electricians, painters, carpenters, metalworkers, materials importers and smaller scale creative studios and e-tailers. Rental for this site will support and subsidise the main Make.XXL ecology. We seek to engage the local community, whilst also extending our reach across and along the Thames. The learning programme will create tangible developmental opportunities for young people whilst wider public involvement is invited through a riverside sculpture park with outdoor temporary event spaces and a social hub with café and exhibitions. The research, education and fabrication spaces will be harnessed to generate apprenticeships as part of a joined-up Thames Estuary Apprenticeship Programme – a self-sustaining talent pipeline for London. 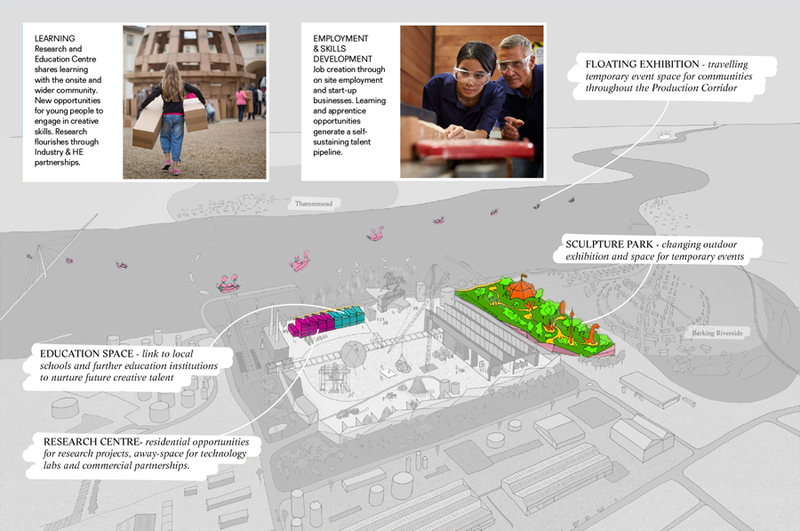 An improved public realm onto the river will extend eastwards from the Barking Riverside development, which the sculpture park has been located next to encourage interaction. 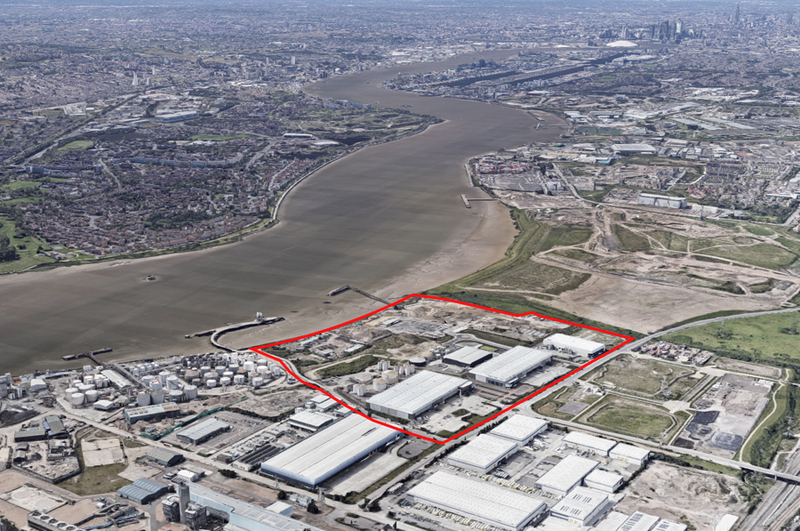 The river creates a focal point linking with the nearby emerging cluster; LondonEast-UK business and technical park; soon to open Bow Arts Lakeside Centre at Thamesmead; proposed Dagenham Film Studios; High House Production Park, Silvertown Studios to name a few. To aid connectivity, a dock will allow transfer of goods directly to and from the Make.XXL site and a river boat will transfer passengers north and south across the river. 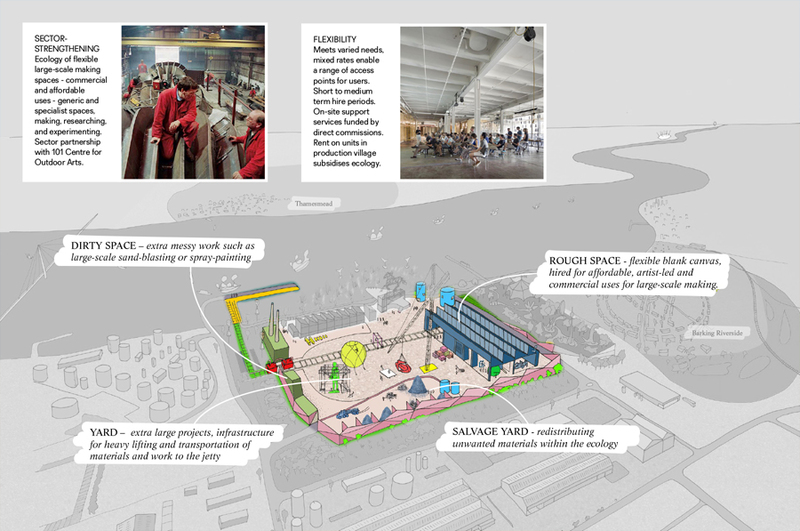 An occasional floating pontoon will offer a temporary event space for the communities throughout the Production Corridor – both practical transport and visitor attractor. 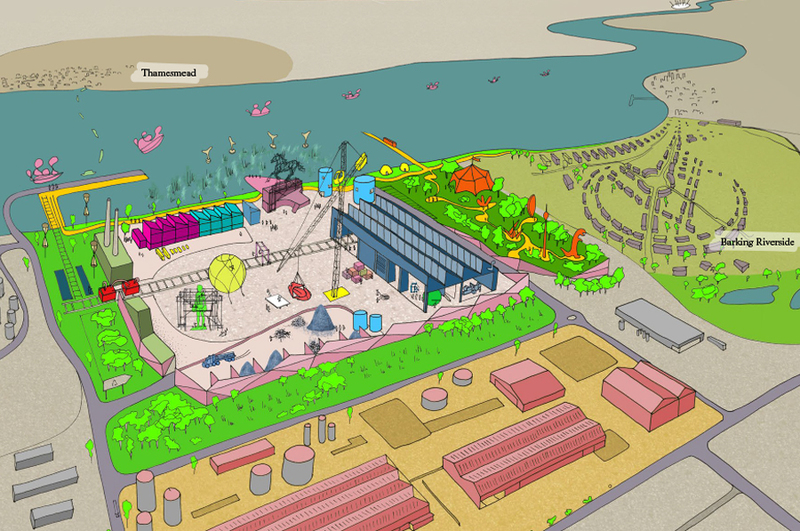 Collectively, this flexible proposal will build community and grow the UK’s creative DNA, through a varied production offer which practically animates and connects to the river as a part of a wider Thames Estuary offer, funded through a mix of commercial use, education, industry and research partnership.